INA ROAD EXIT (fastest route from Phoenix): From I-10 take the Ina road exit. Turn left or east on Ina road. Ina changes names to Skyline and then Sunrise as you proceed East. The Catalina Mountains will be on your left. 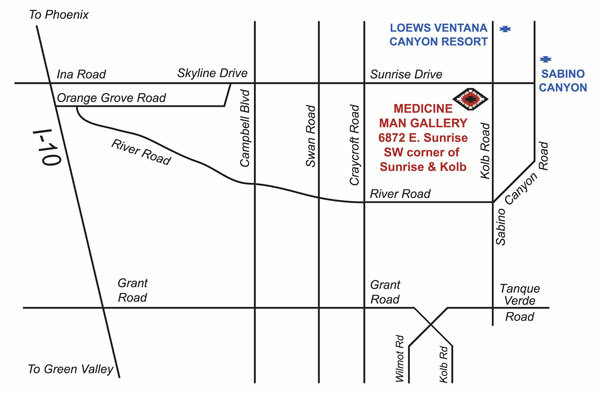 Turn right into the Ventana Village Center located on the Southwest Corner of Sunrise Drive and Kolb Road. You will see Wells Fargo Bank at the corner. The gallery is located in the Ventana Village plaza at 6872E. Sunrise Drive, Suite 130. Phone:520/722-7798 or 800/422-9382. GRANT ROAD EXIT (fastest route from Green Valley): From I-10 take the Grant road exit. (From Phoenix turn left on Grant, from Green Valley turn right on Grant). Proceed east on Grant, passing Swan, then turn left on to Craycroft going north towards the Santa Catalina Mountains. Turn right onto Sunrise Drive and Kolb Road. You will see Wells Fargo Bank at the corner. The gallery is located on your right in the plazaa - 6872 E. Sunrise Drive, Suite 130. Phone: 520/722-7798 or 800/422-9382.